In 1870 De Ferranti started experiments in Europe on induction furnaces. The first induction furnace for melting metals was patented by Edward Allen Colby in 1900. The first steel made in an induction furnace in United States was in 1907 in a Colby furnace near Philadelphia. First 3 phase furnace was built in Germany in 1906 by Rochling- Rodenhauser. In India the use of induction furnaces started in mid sixties. Imported medium frequency induction furnaces were used from mid seventies. Early eighties to mid nineties sudden growth has taken place. During this period indigenous manufacture of the induction furnaces also started. Initially induction furnaces were used for melting stainless steel scrap but these furnaces are used for mild steel production from mid eighties. There are mainly two types of the induction furnaces. They are given below. i) Induction channel furnace – In this furnace induction heating takes place in the channel which is a small and narrow area at the bottom of the main bath. 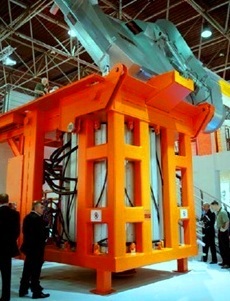 The channel passes through a steel core and the coil assembly. Such type of furnaces are not been used for the steel making. The coreless furnace has a fairly simple construction. This basically consists of the refractory lined vessel and the surrounding coil borne by a steel frame. An coreless induction furnace is shown in Fig.2. When AC current flows through the coil, it creates an electromagnetic field which in turn induces eddy currents in the charged material. This charge material gets heated up as per Joule’s law and with further heat the charge material melts. 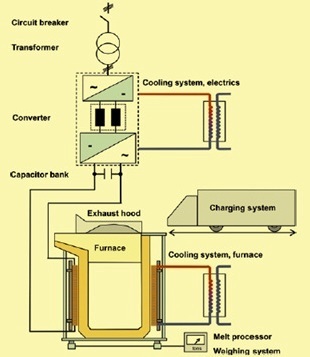 Since the charge material gets melted on its own by the generated heat, the emissions created by other type of furnaces are not found in the induction furnace. The eddy currents induced in the furnace charge and the magnetic induction creates electromagnetic forces. This basically run in a radial direction to the furnace axis and press the melt inward away from the furnace wall. Gravity works against these forces and hence a dome is formed on the bath surface. Additionaly a bath flow is created in the form of two eddy toroids with opposite direction of the turns. This is attributable to the fact that the radial pressure reaches as maximum around halfway up the coil due to the lakage of the field at the coil end. The power distribution and flow pattern is shown in Fig 3. The inductive bath agitation firstly leads to a good homogenization of the molten metal with respect to the temperature and chemical composition. It also stir the charge materials and creates optimum heat transfer conditions for melting of the charge materials. Power is supplied to the induction coil through a transformer, a frequency inverter and a capicitor bank. The capacitor bank is to compensate for the reactive power. Further since the induction furnace is switched on via a time ramp, all types of flickers and grid loading through rush currents are avoided. The current fed in by the inverter oscillates with a resonance frequency (within 60% to 110% of the nomonal frequency) and it helps in constant load regulation in a simple manner. • Smallest possible wall thickness so that the expenditure on the capacitor bank to control the reactive power can be reduced. This also helps in higher electrical efficiency. • It should not allow the liquid steel to penetrate the refractory wall. In case of penetration into the coil there will be short circuit and a break out. • High mechanical and chemical resistance to withstand the loading caused by the bath agitation. Spinel forming dry masses on MgO and Al2O3 are the lining material preferred for the lining of the IF. These masses have application limits of high temperatures (Over 1750 deg C) along with favorable thermal stability and low infiltration tendency. A large tonnage of mild steel is made through IF route in India. While producing this steel, the chemistry of end product is controlled. The chemical analysis of all the input materials is done to have a decision on the charge mix. After completing 50% charging of the input materials, a bath sample is analyzed for chemical composition. Based on the chemical analysis of the bath sample at this stage calculations are made for further additions of the metallics. If the bath sample at this stage shows high percentage of carbon, sulphur and phosphorus then the sponge iron content of the charge is increased. Final bath sample is taken when 80% melting is completed. Based on the analysis of this sample there is another adjustment in the charge. The lower content of carbon in the sample is corrected by increasing the quantity of pig iron/charge iron in the charge. Silicon and manganese in the metal is oxidized by the iron oxide of the sponge iron. Sulphur and phosphorus is also diluted by the sponge iron. Because of use of sponge iron the trace elements in the steel made in the IF remains under control. The comparison of the operating parameters of induction furnace with those of electric arc furnace is given in Table 1. The induction furnace has the following technical advantages over electric arc furnace. ii) Relatively cleaner process and lesser environ related expenditure. viii) Induction furnace is suitable for charging addition agents any time due to the charateristics of the bath agitation. i) The requirement of minimal wall thickness of the refractory lining is having risk of crack formation resulting in stoppage of operations. iii) Decarburizing, desulphurizing and dephosphorizing is restricted due to refractory wear. iv) The non metallic component of the charge materials is to be kept under control so that volume of the slag remains under limit and does not have adverse effect on the lining. Is ‘desulphurisation’ possible by cored wire injection in Induction Furnace Steel Making Process ? Is anybody practicing the same in India ? Successful trials have been made by JAMIPOL (a Jamshedpur based company) to produce dephosphorising compound which they might commercialise shortly. The only requirement in this is that the refractory lining of the induction furnace will have to be completely changed to neutral refractory, rather than silicon refractory. Charging of De-Phos compound directly into the IF is not an ideal solution due to problem of low lining life leading to low furnace availability, high volume of slag, lower yield etc. It is better to treat metal in a separate De-Phos station after tapping from IF and then treat in a LRF for adjustment of temperature and chemistry. Interested parties may contact us for further details.